Arsene Wenger spoke to French radio station RTL last night with fomer player France international defender and World Cup winner Bixente Lizarazu questioning the Arsenal manager. For AshburtonGrove.co.uk, our French friends at Gro(o)ver.fr has translated the interview for us. Check out their blog - which is mainly in French or you can follow their English and French tweets on Twitter. "I was upset. We though we could win all the trophies, but we failed due to a lack of character. It is the most frustrating season I've had to go through. 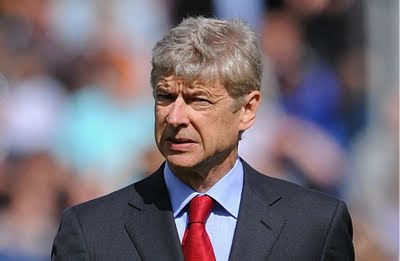 "The team played some of the best football I saw at Arsenal, but failed to reach the top when needed. It is frustrating and questionning. We need maturity." "We will try to buy players who could gave us what we need. It's a difficult task. Firstly, we have to enforce defensive line. We lost points against teams who play the natural English way of football, with long balls and physical struggle. "Fabregas will not go this summer. Last summer,Barcelona made offers, but on this one there is no offers at all. He's the best midfielder in the world, we built the team with him around him. He's our captain, we want to keep him at any cost. "As far as I know, Madrid doesn't want to sell the player, which is understandable. And the fact that Zidane is now close to the club will reinforce possibility of that Benzema won't move." "Only world class players can reinforce our team, because we already have a world-class quality football. The target is to keep our qualities, strengthen them and get rid of our weaknesses. "We still have to improve offensively, because we are an offensive team. There are people who ask me to change our way to play, but I think we have to keep going with this style of play." "I will spent my holidays there, scouting players and meeting people in South America." For analysis, my thoughts and the rest of today's Arsenal news, read today's blog post.